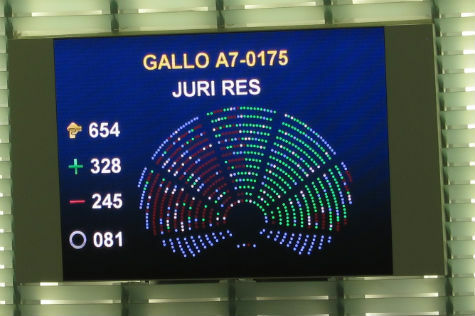 Tomorrow, the European Parliament will vote on the Gallo report that deals with the enforcement of intellectual property. Drafted by a partner of the French President Nicolas Sarkozy, the report paves the way for draconian anti-piracy measures to be introduced across Europe, potentially affecting the lives of millions of Internet users. In recent years pro-copyright lobbyists have pushed governments worldwide to adopt harsher anti-piracy legislation. Thus far they’ve booked several successes, with the controversial trade agreement ACTA as the most important victory. But there’s more. Tomorrow the European Parliament will vote on another document that could turn the Internet into a copyright police state. The Gallo report, named after the French MEP Marielle Gallo, is an initiative report. This means that it’s non-legislative, but that doesn’t make it less dangerous. It functions as advice for all European member states and offers local governments and lobbyists an excuse to push for harsher anti-piracy measures. Among other things, the report offers advice to ”complete the legislative framework to introduce a set of measures to combat intellectual property infringements”. Furthermore, it promotes ”voluntary” partnerships between Internet service providers and copyright holders to crackdown on copyright infringers. In its current form the Gallo report paves the way for various draconian anti-piracy measures to be implemented across Europe, such as three-strikes schemes for repeat uploaders. Although this idea is not really new, the voluntary agreements won’t have any governmental oversight and could therefore lead to disconnections without a fair trial. TorrentFreak spoke with Christian Engstrom, Member of the European Parliament for the Pirate Party, who is one of the most prominent opponents of the reports. Engstrom told us that the “voluntary” agreements could pose a serious risk, as these “self-regulatory” systems take away fundamental rights such as the right to a fair trial and the right to privacy. Another problem with the report is that no distinction is made between counterfeiting and unauthorized file-sharing. According to the report, producing counterfeit medicine is the same as sharing copyrighted music online. Much like the entertainment industry commissioned reports that have been published in recent years, the terms counterfeiting and piracy are used interchangeably in the Gallo report, which is misleading to say the least. MEP Engstrom told TorrentFreak that there is no basis for the report at all and no hard figures to justify these suggestions. The report itself even states that there are still several uncertainties about the impact of online copyright infringement on our society. Still, it makes recommendations that seem to assume that there is a correlation. Instead of passing the report, Engstrom recommends that the European Parliament invests in decent scientific research on the issue. Engstrom himself is backing an alternative resolution submitted by the Green, Social Democrat and Left groups, which he thinks is more balanced. This alternative mainly targets counterfeiting and leaves online copyright infringement untouched. The main differences between the two reports, and a third alternative, can be found in this overview. European citizens who are against the report are encouraged to take action today, before it’s too late. La Quadrature Du Net has set up an excellent campaign page with some pointers on who to contact and what to ask for. Update: The Gallo report was adopted on Wednesday with 328 votes in favour, 245 against, and 81 abstentions.